Carbeth, that thorn in the flesh of the authorities, that mother of hutting in Scotland, that unruly, community-minded bunch of diverse, hard-nosed and opinionated working people, has yet again been the subject of scrutiny; this time concerning hut prices, values and worth. In the light of a recent post in Reforesting Scotland’s 1000 Huts campaign page concerning Carbeth and the price and affordability of huts there, I’d like to set some things straight. I write, not in antagonism in any way, nor wishing to start any argument, merely to present facts and some opinions. The post has concerns also, I think, for the wider movement of hutting in Scotland in which Carbeth has played an integral part, especially in recent years. It’s necessary to frame this debate, brought about by the post in RS 1000 Huts campaign page, within a brief historical context, in order for folk to begin to understand the ethos of Carbeth and from there, perhaps, hutting as a whole, both old, and as a renewed movement in Scotland. Before there were huts at Carbeth, there was the Fellowship Camp: a name which speaks for itself. When soldiers returning from the first world war (in Carbeth’s instance from Clydebank & Maryhill in Glasgow), suffering mental and physical agonies, they were only too well aware for the need to recuperate and find some solace in the hills north of where they lived, in what was then a completely rural area. They were also fired with a vision of what Scotland could be after that war: A place of equality and solidarity, of mutual help and sustenance. When, during the second world war, Clydebank folk suffered the obliteration of their houses in a blitz: bombing raids, many shipyard workers and factory hands moved their families to Cartbeth. They built on the foundations of those first soldiers – the sense of solidarity and an awareness of a precious haven in the hills – and also brought a newer sense of their own worth, as workers, as trade unionists, as brothers and sisters united in many struggles. It was at Carbeth and around that men and women trained for the struggle against fascism before joining the International Brigades in a Spain torn by fascism and resisted by communists and socialists, of which Scotland supplied a number of doughty principled folk. During the close of the 20th century, when the then landowner attempted a gentrification of Carbeth, together with huge hikes in rent, he triggered a 13 year rent strike, which led to a community buy out. I’d like to stress that word: community. This was a 100% agreed struggle with hutters at Carbeth toward a buyout, though some believed it would never be achieved. It was. Carbeth holds a unique place in Scotland’s social history: founded on fellowship, ideals of equality, solidarity and socialist principles, it became the first community buy out in Scotland of non-residential, central belt land. A total now of 150 acres. This is also the long struggle of Scottish – and working folk everywhere – to have control over where they live, or relaxe, and to shine a light on unfair practices in capitalism and by Scotland’s landowners – a struggle which continues. Land, if not seized, as in Latin America, say, must be paid for. Perhaps at Carbeth we were naïve, idealistic. We raised a huge amount of money ourselves, from the pockets of ordinary hutters and rent unpaid for 13 years, but squirrelled away, and managed to raise a bank loan for the rest. The loan had then to be repaid. Hutters voted for a £1000 per year ground rent to help repay our bank loan (not a mortgage, by the way). Our naivety was in thinking that when we allowed potential hutters to join our ranks, build huts, or take over dilapidated huts to refurbish, they would be or would become aware of our history and share our principles and ideals. Ideals that have always run against the strain of capitalism and especially of real estate. Carbeth – and other sites existed until greedy landowners either bulldozed them or raised rents beyond the pockets of the poor and humble (but strong and principled) – has always been about community, about sharing, about joint (or solitary) enjoyment of Scotland’s rural areas. It has never been about people with large wallets buying into a wee bit of real estate (all land at Carbeth is jointly community owned by all hutters) who then might wish to sell on, having considered a hut at Carbeth an investment. It is of course, an investment, an investment in those principles I’ve mentioned, but also in terms of mental and physical well-being and in environmental education, in turning in one place the tide of landscape degradation we see in other parts of this country. Who sets a financial value on a hut? Is a hut worth £20,000, £30,000, £66,000 simply because I say it is? Because I have spent money on building or refurbishing it? What is the value of community, solidarity, health, well-being, safety and environmental education that owning a hut brings. We perhaps should discuss values, profit and priceless, intangible common currency. Perhaps we should not just have relied on voluntary codes (our naivety!) but on other, signed, legal documents. We hold leases, yes, but perhaps they don’t go far enough. Perhaps there should be a covenant of resale, and that only after a certain number of years have elapsed. There should be a covenant which states that Carbeth is a Conservation Area, a unique place, and is not for property speculation. Perhaps the covenant should mention a price cap for resale: by all means, spend large sums of money if you have it on a wee humble wooden hut, with no mains connections, off grid, with only stand pipes for water, but be aware that you may not recoup your costs if for some reason a hut needs to be sold. Naivety may be exploited, but ideals and principles are not so easily subverted. The old hutters scrounged, salvaged and built their huts, with neighbour’s help, from bricks brought in on corporation buses for foundations, with timber surpluses in shipyard and building site,. Old, defunct buses were pressed into temporary use and wooden structures built around them. The notions were thrift and recycling (before that was common), the make-do-and-mend of folk with little or no money. Times change. Of course they do. But Carbeth need not become a place of financial speculation. No-one is allowed to build what they want on say, National Park land, and then sell for profit. The new generation of potential hutters within Reforesting Scotland’s 1000 Huts campaign need to be keenly aware – as indeed a majority seems to be – of the political forces that have shaped Scotland’s landownership, and particularly aware of the counter-movement which has always existed in this country and especially at Carbeth. Huts are beginning to spring up here and there again in Scotland, a country with woeful access to landownership, use and (hut-) building rights. Let us hope that within the diversity of huts and hutters, landscapes and envcironments, hutters will remember the struggles that have made even the small (but growing) number of huts possible. Owning a Carbeth hut is not a right, but a privilege and there are responsibilities to be taken into account as well as the presumed rights of ownership; the responsibilities of tradition and vision, equality to hutters and to the land itself. Huts anywhere are not second homes, they are political statements. Huts are a way of life. Hooray for Carbeth, leading light for hutting in Scotland, inspiration and advisors to the Thousand Huts campaign, which I am part of. We’re not inventing huts for the first time but reinventing them, building on the firm foundations of those who have gone before. Huts aren’t holiday homes. If you have the money and you want a holiday home, go ahead (but don’t buy one which a local young family could be using). Huts are huts. 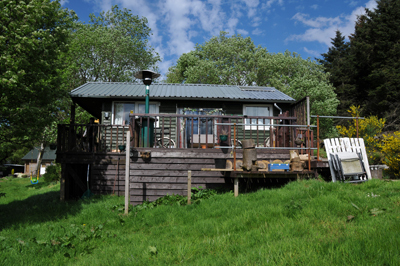 That’s why Reforesting Scotland wrote the definition which went into the Scottish Planning Guidelines- A simple building used intermittently as recreational accommodation (ie. not a principal residence); having an internal floor of area no more than 30m2; constructed from low impact materials; generally not connected to mains water, electricity or sewerage; and built in such a way that it is removable with little or no trace at the end of its life. Huts may be built singly or in groups. We support Carbeth in its efforts to keep huts affordable for all. All I knew till now about Carbeth was the story of its origins and of the ethos of hutting at that time. At the moment a tenement flat in Aberdeen can be had for £55,000 so when I read posts about huts selling for prices less than half of that I realised that hutting as I understand it is being threatened. Really good article, socially most interesting, as gets to the heart of the effects of war, and the struggle of the poor for dignity and rights. The huts at Carbeth were a dim awareness in my mind, and I have not visited any, but this really brings the community there into focus. Thank you. My parents owned a hut in the 60’s. My siblings and I enjoyed our summer holidays in Carbeth. I remember the outdoor swimming pool..Not for the faint-hearted! This is a most interesting article. I have a family member who owns a hut in Carbeth and I have been to visit. I am impressed by Carpeth and think that its goals are very worthy. For much too long, theorists of the left and right have scoffed at our need for connection to our own land. However, if hutting is to really work there must be a strong legal structure for hutting areas allowing for leadership to implement some degree of area discipline and reiterating that huts are not for permanent occupancy and are not investment vehicles. Excellent piece. Could you be clearer on the post which stimulated it? A link? It is a shame that you didn’t draw up documents stating the ethos behind Carbeth, must be acknowledged and the principles agreed to when building restoring or buying a hut. Cash is always king in this world. However can I poi t out to you that you’re certainly not too late to have these documents drawn up, for future but owners to sign as per contract? You should be able to raise some funds again to cover the legal costs, and if you can’t then you can draw up your document yourselves and indicate that people are entering into a contract. You could submit them to a lawyer if required, but by signing an agreement there is recourse if the agreement isn’t upheld. Some legal advice wouldn’t go amiss – first session being free which is all you will require. How amazing a landowner of the early to mid twentieth century opened up their land to allow soldiers to recuperate and to provide land for huts after house loss. How prevalent a practice among landownders was this after the world wars? Also, would be interested in how much the rents rose alongside the rise of neo loberalism and austerity. You say no rents were paid for thirteen years, that is a long time. Was this due to legal proceedings?